Severe sciatic nerve damage keeps Douglas Dockstader from living the life he’d like. BAYONET POINT, Fla. — Severe sciatic nerve damage keeps Douglas Dockstader from living the life he’d like. But when he does get out of his Bayonet Point home, he can’t go very far on his electric chair. 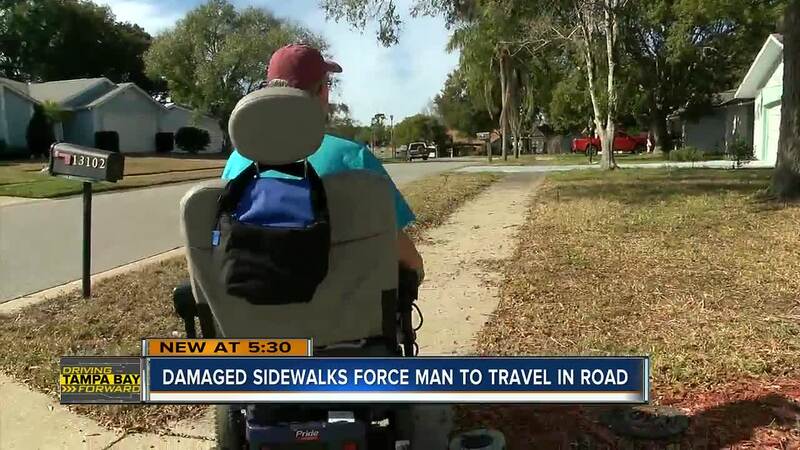 That's because where his street ends, the sidewalk does too. And when he tries to move toward Fivay Road, he must dodge cars because he’s forced to ride into the street. When Douglas makes it to the sidewalk on Fivay Road it doesn’t get much better. Some parts of the sidewalk are overgrown with weeds and others are simply falling apart. One dip recently sent Douglas into the ditch. Pasco County officials say if you have issues with the sidewalks in your neighborhood, you need to report it. The county only maintains sidewalks they’ve constructed. Douglas doesn’t expect any quick fix, he just wants more thought put into those who are disabled. Contact the Pasco County Customer Service Department at 727-847-2411 for help with any sidewalk related issues.